David McCormack is an International Trade Specialist in the U.S. Foreign and Commercial Service. Russell Adise is an International Trade Specialist in the Office of Service Industries. 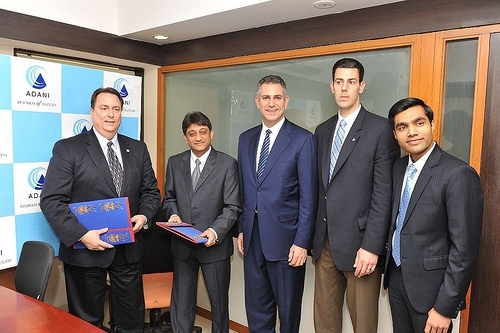 On February 22, Under Secretary of Commerce for International Trade Francisco Sánchez witnessed the signing of a new Memorandum of Understanding (MOU) between two major world ports – the U.S.’ Port of Baltimore and India’s Mundra Port – that will facilitate maritime cooperation, exports and trade flows between the U.S. and India. The two-way trade between India and the U.S. grew to $58 billion in 2011, and this upward trend is expected to continue in 2012. This MOU is a perfect example of the U.S. and India working together to meet India’s infrastructure needs while supporting American jobs. For U.S. seaports, sister port partnerships are an important tool for expanding their trade links, trade routes, port marketing, and infrastructure development activities throughout the world. The Port of Baltimore’s new agreement with Mundra Port follows similar agreements with ports in Taiwan, Poland, China, Russia, Italy, Ghana, Egypt, The Netherlands, and France, illustrating Baltimore’s importance as an international trade port. U.S. seaports are a critical conduit for U.S. exports. More than $455 billion in exports flowed through America’s sea ports in 2010. Ocean transport carries more U.S. international merchandise than air cargo, trucks, railroads, and pipelines combined. More than 75 percent of U.S. merchandise trade by volume – and more than 36 percent by value – leaves the United States by water, making U.S. seaports a critical component of our national and global economy. In addition to their participation in the Trade Mission, U.S. seaports such as Baltimore are also partners in an important ITA initiative aimed at meeting the President’s NEI goals. In July 2011, Under Secretary Sánchez traveled to the Port of Oakland to launch the Partnership with America’s Seaports to Further the National Export Initiative. This partnership between ITA and the American Association of Port Authorities is helping U.S. seaports to leverage federal and local resources to help small and medium-sized firms to achieve export sales. Under Secretary Sánchez is in Ahmedabad for the second stop of the Department’s first-ever Ports and Maritime Technology Industry Trade Mission to India. This Trade Mission is furthering President Obama’s National Export Initiative (NEI) by raising the profile of the U.S.’ world-leading ports and maritime technology sector among Indian commercial counterparts. The trade mission participants include dredging companies, port security companies, scanning technology providers, and transportation and logistics companies. The Port of Baltimore is one of twelve U.S. private sector and municipal organizations participating in the trade mission, which will conclude in Mumbai on February 24. The Trade Mission is the first in a series of events planned for 2012 that are designed to expand U.S. export opportunities within India’s infrastructure sectors. In particular, Commerce Secretary John Bryson will lead a high-level trade mission to Delhi, Jaipur, and Mumbai on March 25-30. It will be Bryson’s first trade mission as Commerce Secretary. For more information on the Trade Mission, please contact Trade Specialist David McCormack at david.mccormack@trade.gov, (202) 482-2833. Additional information on the Trade Mission can be found on the India Ports Trade Mission’s website. For more information on the ITA-AAPA Partnership With America’s Seaports to Further the National Export Initiative, please visit the Partnership’s website or contact Trade Specialist Russell Adise at Russell.Adise@trade.gov, (202) 482-5086.